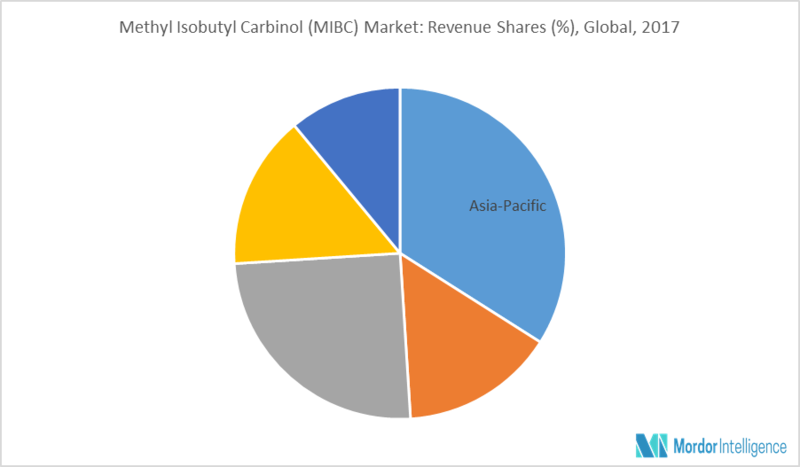 The global methyl isobutyl carbinol (MIBC) market is expected to register a CAGR of 2.85% during the forecast period. MIBC is used in frothers, surface coatings, adhesives, cosmetics, toiletries, and cleaners; finds application in the pharmaceutical industry for the extraction of vitamins and minerals, as wetting agents in lithographic printing, and as chemical intermediates; it is used in the production of lube oil additives, hydraulic fluids, and plasticizers. Owing to growth in the plasticizers’ demand for end-user applications, such as, flooring & wall, film & sheet coverings, wires & cables, coated fabrics, consumer goods, etc., the demand for MIBC is also expected to rise. Additionally, the rising demand for lightweight vehicles and introduction of new emission standards have been driving the demand for PVC products in automotive applications. MIBC is generally mixed with PVC for the plasticity and viscosity of the product used in the automotive industry. Thus, growth in the demand for such products in the automotive industry is likely to increase the demand for MIBC during the forecast period. In 2017, Asia-Pacific was the dominant consumer of the market. This region is also expected to be the fastest-growing market, owing to growing demand from developing economies for automobile, mining, and coating industries. The increasing number of mining operations and upcoming government projects in China and India are providing a lucrative opportunity for the growth of the market in the future. The United States is expected to continue being the leading country in North America. Robust growth in the mining industry is expected to favor the market growth over the forecast period. Copper mining has been a major activity in the United States, with vast deposits of copper available in the country. September 2017: Celanese Corporation announced the increase in prices of its acetyl derivatives. The product price of MIBC had increased by USD 0.08 (USD/lb). May 2017: Sumitomo Chemical announced that it is establishing a new manufacturing and sales base for polypropylene (PP) compounds in the city of Chengdu, Sichuan Province, to strengthen the Automotive Materials business in China. MIBC is used as a plasticizer in these compounds. The major players include – Shell Chemicals, BASF SE, DowDuPont, Mitsubishi Chemical, and AkzoNobel Industry Co., among others.